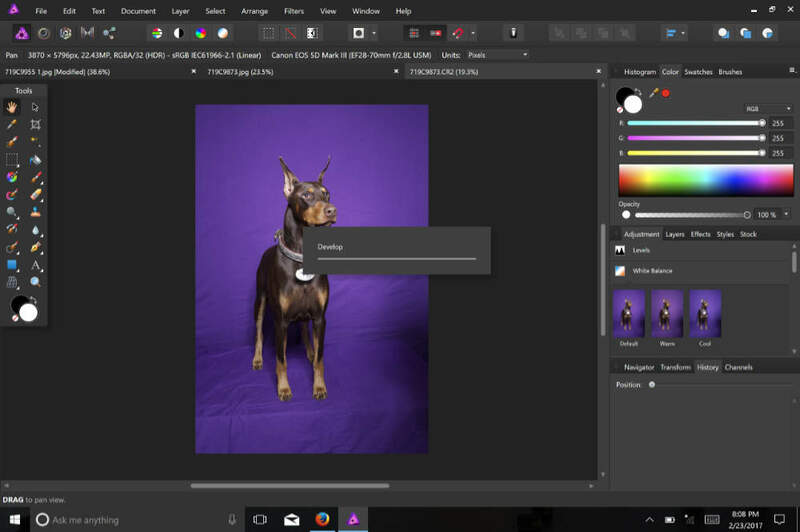 James Morrissey shares his experiences using Affinity Photo for Windows. Is there finally a real alternative to Photoshop? I have been using Photoshop for as long as I have been taking digital photographs. My first version was Photoshop 5.5. From there, I moved up to 6, 7, 8 and to the CS series. The long and the short of it is that I have been using Photoshop for a very long time and I am very comfortable with the format. In 2013, Adobe made a business change and eliminated selling new versions of its product in favor of a subscription model. To say that I was distraught is an understatement. Now, I am not demonizing Adobe for having done this. As a marketer of products, there is a real value in having a consistent stream of revenue versus being dependent upon an upgrade model. However, as a consumer, I do not feel that it is in my best interest to work in this model as I believe it helps stifle the desire to continually come out with new and exciting innovations. It really shows how powerful and how much better Adobe's products have been that they have been able to force a monthly subscription system - and that it has taken nearly 4 years for an alternate product to be produced that truly is competitive. I am NOT looking for a free ride. I do not mind paying for quality software. For example, I paid about $300.00 for each upgrade cycle when I was using Adobe (not including the entry fee, which was over a grand). However, the truth is that I frequently skipped a product upgrade cycle or two as the feature sets did not change that drastically. It is not unfair to want to make sure that when I do purchase software that I am paying for upgrades that I believe are relevant to me. Conversely, the idea of paying a monthly fee for Adobe CC (or any product) when I don't need many of its improvements seems a bit silly. This is the Smart Select Tool - which with the pen on my Vaio Tablet, I find to be amazing and accurate. CS5 has been such a well designed workhorse that I really have not needed anything else...until this year when I upgraded to a laptop earlier this year that was running Windows 10. My new Vaio has a high resolution screen and the old version of Photoshop CS 5 does not scale very well. At the same time, my middle aged eyes don't particularly care for the small fonts and I have been pretty much forced into doing something about the fact that CS5 was not going to be able to continue as my workhorse for much longer. There are some workarounds for the scaling issue I mentioned if you look, but nothing is perfect. I ultimately did download Adobe CC and performed the free 30 day trial during this period as I was not sure I wanted to go through the efforts of re-learning how to edit a photograph. I will put it out there as bluntly as this - while I will admit that Adobe CC feels an awful lot like home to this long-time Photoshop user, I decided that it is not a home that I wanted to live in any longer. 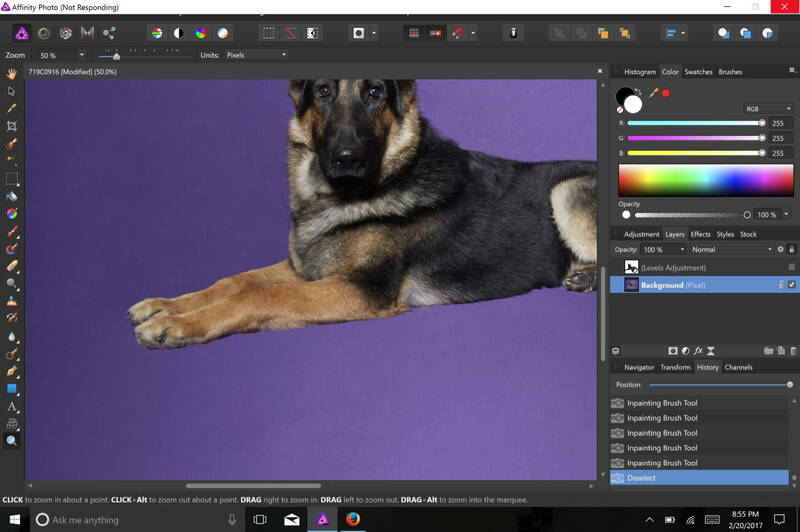 Enter Affinity Photo for Windows. 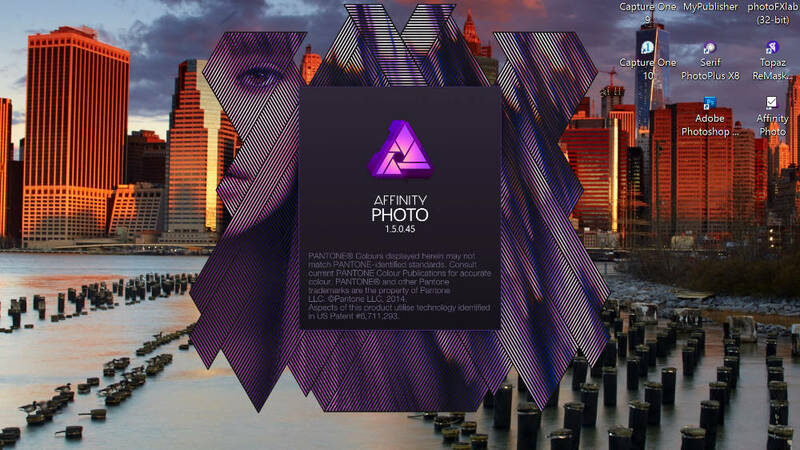 Affinity Photo was originally released for the Mac in 2015, and it entered took the photo editing world with by storm. It won the Apple App of the Year award in 2015 and many of us started noticing and wondering why it was not available for Windows? Well, that changed late last year when they produced a beta for Windows and ultimately came out with a full fledged version. I am proud to have contributed to the best of my ability during the beta period. Cleaning up backgrounds with the In-Painting Tool (similar to Content Aware) is much easier now. Affinity Photos for Windows is a pretty remarkable program - particularly when you consider that you can buy a full version for $49.99. I do not hesitate to say that there is nothing I can do in CS5 that I cannot do in Affinity Photo. It allows all the basics and more - levels, curves, layers, macros (actions), panoramas, HDRs (for those into that style of photography) and even third party plug ins. While I use Phase One for my raw editing, it also allows for RAW processing. The biggest issue when switching over to Affinity Photo after years of working in Photoshop is that the user interface is so close that it is actually winds up being a bit counter-intuitive as it is not exact and I find myself making mistakes. Having said that, a learning curve is to be expected when you are doing something new. There is a wonderful database of over 200 'how to' videos available on Youtube and whenever I have a question, I find myself watching their videos whenever I need to so something that I am not familiar with. For example, I wanted to refresh some re-touching for taking out wrinkles and impacting things like eye-color in a natural way. It was incredibly useful. I have subscribed to the Affinity Photo channel on Youtube and it flags me whenever there are new videos available that I may be interested in. My apologies for the odd way that the image is floating in the iddle of the screen. It is not supposed to be. I think it is because I made it a gif to decrease size. The Affinity Youtube Channel of Free Tutorials. One of the other major differences between Affinity Photo and Photoshop is the requirement to work in layers. While you certainly can do this in Photoshop, it is not a categorical requirement. I have decided that being forced into working with layers is ultimately a good thing as it means that the work you to your photograph is non-destructive to the original content of file. However, moving between the layers can be difficult at first when you are still getting used to figuring out the workflow. When you save the image, you can either save it as a full size Affinity photo (which you have the option to keep the history) or export it as a jpg, tiff or other file format. One quibble is that I wish you could do this all from the 'save' or 'save as' menu as opposed to having to Export a file as a separate action from saving a file. The program otherwise functions much like Photoshop. I have been using their equivalent of Content Aware - and I have got to say it is pretty amazing. Also, compared to CS5, the use of the pen tool is greatly improved. I have been particularly pleased that I can process photos the way that I am comfortable with and that it is made even easier because I can still use my Nik and Topaz plug-ins. Affinity Photo allows the use of plug-ins! Is there anything I don't like about Affinity Photo for Windows? Well, yeah. Most of it boils down into differences between the two user interfaces. However, that is just part one of the unfortunate problems of having to 're-learn' things. The other thing that I was not in love with was the tendency of the program to 'hang up' when completing complex tasks (for example, when I go over-board with the content aware brush). I started playing around with the memory management tools in Affinity Photo and found that it improved this phenomenon greatly. There are several other items that I find frustrating in Affinity Photo that should not be frustrating. Again, it all boils down to User Interface experience, and I am hopeful that future versions will tamp some of these items down. For example, Affinity defaults back to certain size and styles of fonts, regardless of what I typically use (I am a Papayrus fan for my image signatures)...which means I have to rescroll through every time I imprint text within the image. Also, cropping anything besides default crop modes (8x10, 2x3, etc) is not intuitive. Make sure your memory management systems are working properly when doing complex tasks or the system can 'hang up' for periods of time...that being said, it also happens when I use PS as well. Putting those User interface issues aside though, Affinity Photo really does get the job done. You just sometimes need to do a little thinking about how to get it done. 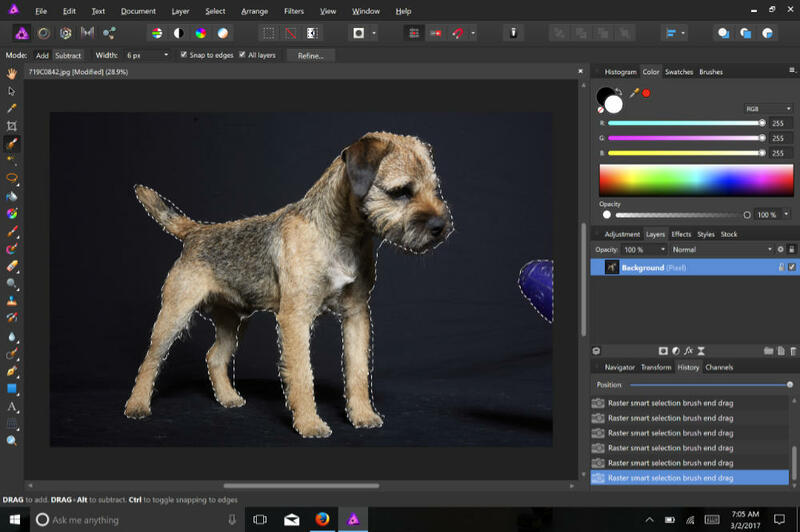 Having extensively used Affinity Photo after the Westminster Dog Show, I found myself recently booting up Affinity without even thinking about it. It has become a comfortable work environment for me and I find that I have been going to PS less and less. I do apologize though as I realize that it is not entirely fair to compare a program that was coded in 2010 to one that was released in 2017 - however, that 2010 workhorse cost several hundred dollars when it was released (and 299 for an upgrade) and Affinity Photo cost 49.99 in 2017. Now, I understand that with the new billing system that you can invest in Adobe for as little as $10/month and it will be 'current.' However, those dollars add up. Over the course of the first year, Adobe will cost you more than double what Affinity will cost, and the longer you use it, the more it costs...and I question how many people are using a feature set that is very different from what you get with Affinity Photo. It is amazing how the landscape has changed in the world of image editing. In 2013, when Adobe changed its billing platform to a subscription base, there was really not a lot of choice for those of us who were diehard Photoshop users. I believe that many of us who resented the new billing model just kept chugging along with what we had - old versions of CS5 and CS6. Affinity Photo is the first real piece of software that I have used that both has the processing power and user interface to make me say that I can live in a Post Adobe world. As I said above, the world has changed and I think that 4 years later people seem much more open to the idea of not owning a physical product and paying as they go. If you choose to opt into the Adobe licensing model, don't worry, I do not think that you will be sorry. Adobe CC is the gold bar standard by which all other programs are judged for a reason. At least now you finally have a real choice - and that is mainly what this is all about. 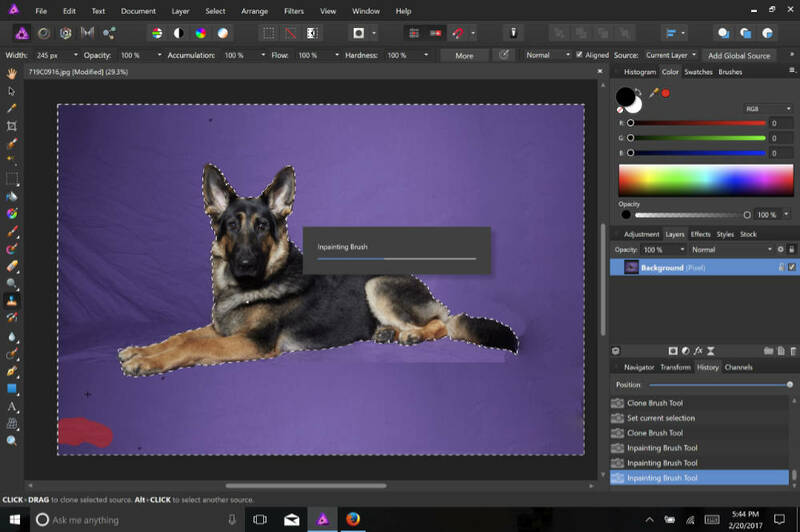 However, if you are one of us who does not like paying subscriptions for a service and want decide for yourself when upgrades are relevant to you, Affinity Photo may be the image editing software you have been looking for. It is an extremely powerful program that gets the job done, in most cases as well as Photoshop - for a lot less money and without the subscription model. Just a reminder that this article is copyright 2017, James Morrissey and the Nature, Wildlife and Pet Photography Forum. If you like the article, please pass the link on. We are dependent on the word of mouth. However, please to not copy the content. Also, I purchased Affinity Photo for Windows with my own money after helping with the Affinity Beta Test project.